Hello ... Hello ... my old friends ... It's great to see you once again! Five lucky winners (and a friend each) will be able to see Jeff Lynne's ELO perform in front of just one hundred people at Chris Evans' Dine And Disco event next Summer, thanks to the text competition announced on the BBC Radio 2 DJ's Breakfast Show this morning in aid of the BBC Children In Need charity. This somewhat intimate gig is scheduled for Saturday 17th June, just seven days before Jeff Lynne's ELO make their bow at Wembley Stadium on Saturday 24th June, confirming the tweet made by elobeatlesforever (elobf) @ Twitter back on 30th October (see above). You can enter the competition by following the instructions and answering the above question by texting the word PARTY followed by the correct answer (A, B or C) to 84222. Each text entry costs £5 with between £2.49 and £3.75 donated to BBC Children In Need (depending on your mobile network). The competition runs up until 11:59AM on Thursday 17th November. Although the chances of winning are relatively slim numerically speaking, this is an opportunity to support a deserving charity and have a chance of seeing/hearing the ELO maestro up close and personal! 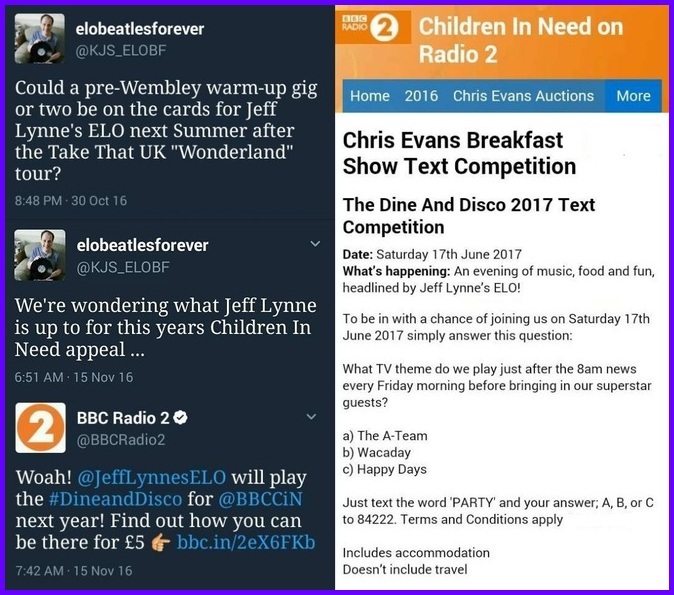 elobeatlesforever (elobf) recommends BBC Children In Need to those enlightened folks who enjoy the music of ELO, Jeff Lynne, Roy Wood, The Move, The Idle Race, 'Brum Beat', The Beatles and related artistes. Yours Truly KJS wishes all participants the best of luck!